A Plush Gift Card allows freedom and choice to create a perfect sofa and living space by choosing from a wide range of styles, configurations, designer fabrics or 100% genuine leather. A Plush Gift Card is the perfect present idea for any occasion: birthdays, weddings, anniversaries, housewarmings, or as a unique way to say thank you to clients staff and family. Plush Gift Cards give access to one of Australia's first specialist sofa providers, specialising in leather as well as fabric sofas. With a Plush Gift Card you or your giftee can select from a huge range of designs and quality at an affordable price point. A Plush online digital Gift Card is the perfect gift for someone moving house, someone that is renovating or for the kids that are finally moving out of home! With over 100,000 combinations available, a Gift Card from Plush gives the gift of freedom and choice to purchase the colour, size and style of item that is just right for their house or apartment. 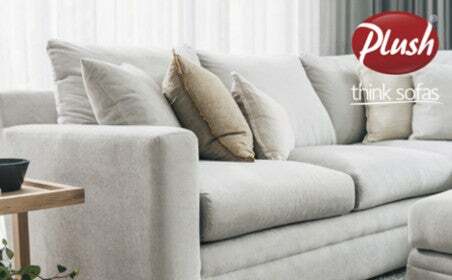 The Plush sofa specialists can help create the perfect lounge room and living area. You can choose from a wide range of designs, leathers, fabrics and configurations to make your sofa as unique as you are. Plush has over 40 showrooms across the country, and most importantly Plush offers an amazing 10 Year Peace of Mind Warranty and Change of Mind Guarantee. At Prezzee, we make gifting easy, simple and digital so you can purchase a gift voucher from home, work or your mobile phone, anywhere you are, at any time. Prezzee has brought a new way of gifting the traditional Gift Voucher. Now, Prezzee you can send your eGift Card via email or SMS as it is 100% digital, instant and convenient which also means it’s impossible to lose or misplace. You also have the option to buy and send Gift Vouchers through the Prezzee App available on any smartphone. Your giftee can also use download and use the free Prezzee App to store Gift Cards for convenience and safe keeping.